Offline & Online - Working Together! Keep me logged in from this computer! What is ChaosHost? 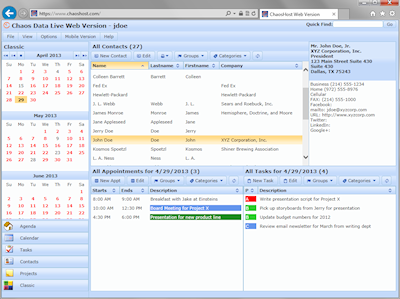 It's a custom designed cloud service for users of our Windows programs: Legal Billing and/or our Chaos Intellect and Time & Chaos CRM software. ChaosHost.com lets you work with the same data in Windows, on the Web, on your Android and on your iPhone or iPad! In a way that is both affordable and easy-to-use, we can offer you a way to work together with your partners and co-workers when you aren't in the same location. We'll take care of the hard stuff so you can work together and get the job done without needing that pesky IT department to get involved. ChaosHost.com keeps you protected by hosting a version of your contacts, appointments, tasks and projects databases here on our server. It also hosts billing data for Legal Billing users. But it is much more than just a backup service. Native apps for Android and iPhone are now available as an additional way to work! Support for ChaosHost is already built into each current version of Legal Billing, Intellect and Time & Chaos. 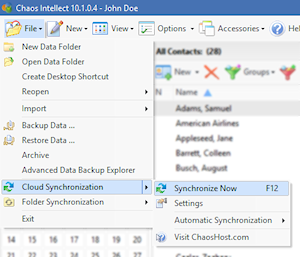 To find it, go to the File menu and look for the option for Cloud Synchronization. The first time you use it, go to Settings to enter your login name and password. After that you'll use Synchronize Now to upload your data to this site and to download any changes made elsewhere back to your computer! You can also turn on auto-sync options to synchronize throughout the day or when you start or stop your desktop application. Away from your computer that has our "real" software? Use our web-based application and you'll get an online crm program that is similar to the current versions of Legal Billing, Intellect and Time & Chaos. When you return to your computer, you can sync the changes to keep your desktop software up-to-date! Take a close look at this screen shot and you'll see this is actually a picture of our web app running in a browser! You can use this online version of our contact manager from any computer-based web browser such as Internet Explorer (8 or newer), Apple Safari, Firefox or Google Chrome. Many current mobile devices can synchronize with Corporate servers using a technology called Exchange ActiveSync. If your device has this feature available, you can likely synchronize it with ChaosHost, too. Synchronizing gives you the advantage of having a local copy of your data to work with even when you don't have Internet access and couldn't use our Mobile ChaosHost. Most devices that support ActiveSync can synchronize Contacts and Calendar data. Some devices can even sync Tasks as well. Setup instructions can be found in the ChaosHost.com Help Files if you want more details. We have a selection of native apps built for Android, available now in the Google Play Store. Look for Chaos Calendar, Chaos Contacts, Chaos Tasks and Chaos Billing! We have native apps for iPhone and iPad: ChaosTasks and ChaosBilling are available now! Have a modern mobile device? Try our specialized version of ChaosHost designed for mobile device-sized browsers. This includes iPhone/iPad devices and Google Android devices. Just type the address https://www.chaoshost.com/m/ into your device's mobile web browser and you'll see an optimized interface for the smaller screen size. No installation necessary as it runs directly from our server. Use the same data at home and at work without remembering to bring a copy home with you. Have other team members share your database and let everyone make updates that are passed along to all users. 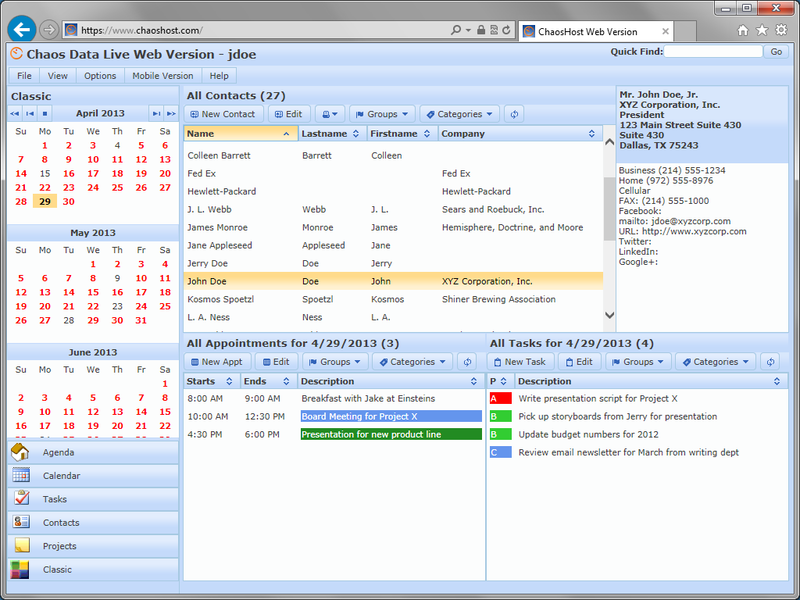 Keep multiple offices in sync with new and edited items getting passed back and forth through our service. PLUS, have access to our web apps to use your data from locations where you don't have our software installed! Even sync with modern mobile devices for a portable copy of your data on the go! Free 30 day trial available! Click here to request for a 30 day FREE trial (no obligations, no credit card charges, no hassles). We want you to have the chance to see our service work in the "real world" before you pay to subscribe! ChaosHost.com accounts are available through a monthly subscription or by purchasing a prepaid service plan. Prepay for 10 months, get 2 free! If you have a question not answered here, contact our sales or support department. We are glad to help!